By way of explanation, his monkey is a stuffed animal that he often wears around his neck … just to see what attention he gets. Quirky sense of humor. One eye. And a long, uncut ZZ-Top type beard. Skins and bones. Him, not the monkey. Okay. So now you might be wondering what would posess me to ask Santa … and his monkey … to do my lawn. Well first you have to understand what my “lawn” is like. 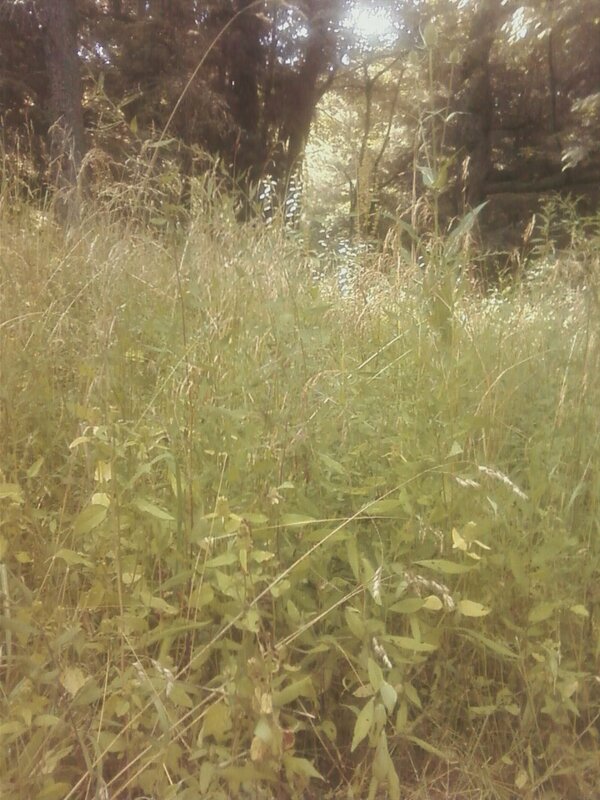 I live in the country … on some acreage that has lots of trees up front. And my house is in the middle of those trees. You’ve heard of the worst house in the best neighborhood? Well, thats my house. Nobody has turned me in to one of those TV shows yet, but you get the idea. Improvements could be done. And improvements to the lawn area would definitely make me happy. And my neighbors. 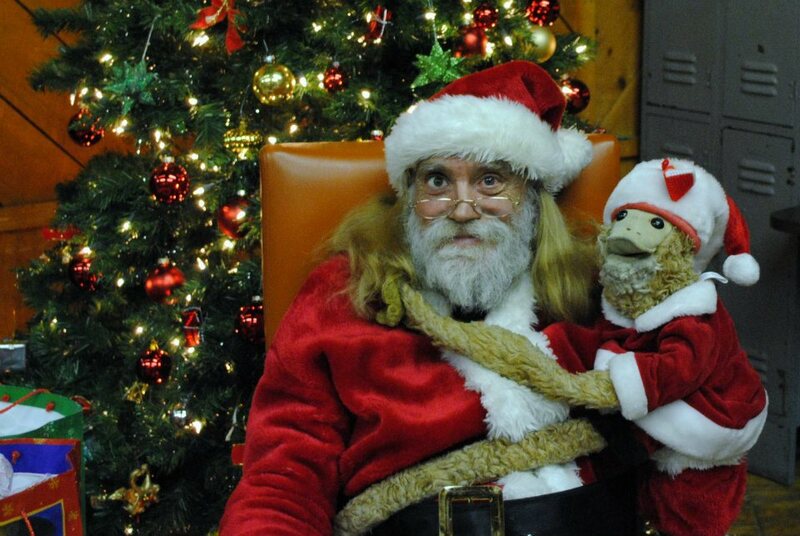 So when I asked a friend if he knew anyone who might be up for the job, he mentioned an acquaintance who had played Santa last year for the Children’s Christmas Party. Hard worker. Good rates. Available on short notice. Perfect. So I picked Santa up at the local get-together … seems Santa has no means of transportation in the non-reindeer off-season except his bicycle. And showed him around the property. This was clearly not a one day project. But he felt sure he could make a significant dent in the area. As we talked, he shared that he was currently battling cancer. I didn’t ask which kind. And his attitude put anyone’s to shame. But then he is Santa, right? One hour and forty five minutes later he announced that he had another appointment and he hoped that what he had done would be OK for a first cut … so to speak. Absolutely magnificent. Astounding. Great work. 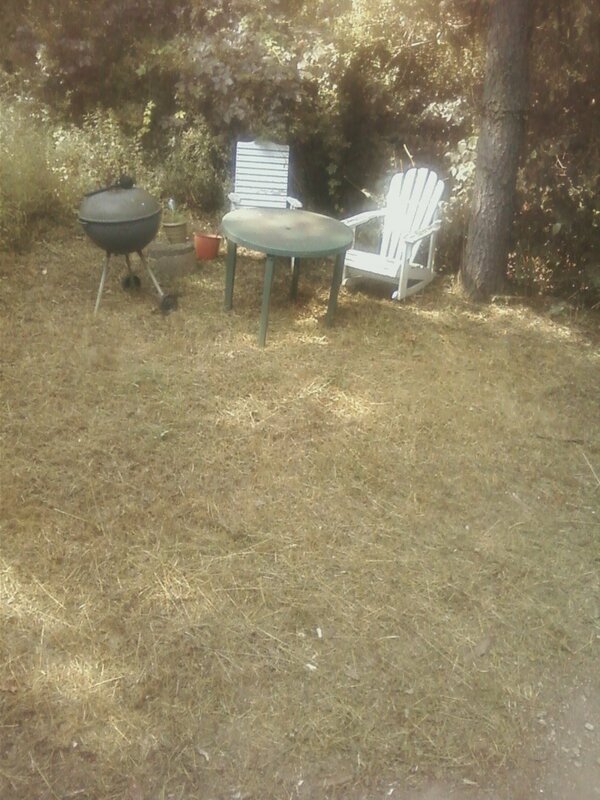 Not only had he cut the weeds and whatnot, he had arranged a few chairs, a table and a charcoal grill in a makeshift picnic area in the corner of the property. Right beside the opening to my septic tank. (Look closely, its the cement thing on the left with a flower pot on top.) But I was touched by his thoughtfulness. On the way back to his house, he shared how he had fought cancer. And although he had not gotten the prognosis he was hoping for, he was still optimistic. And how he took great joy in traveling around to various yard sales to find used toys to give away to needy children in the neighborhood. This evidently was put to the test, when a man who did not care for him much saw him walking home in his outfit. And, not recognizing Santa for who he was, the man came up with sparkling eyes and said “Santa! My favorite person. What can I do to help you?” To which Santa replied “Be kind to others” and went on his way. On coming home I got a call from a friend who knew Santa, and was told that not only did he attend the Childrens Christmas Party, he had also gone to great lengths to entertain children in the local hospital. And he had taken care of a friend who was dying of cancer until his death. And how he had, with his resourcefulness, helped a man completely furnish his apartment. And how he would help anyone who was in need although he himself was facing many personal challenges and housing needs. And he would leave little gifts around for people based on what he knew they liked to cheer them up. In the case of one sick little girl in the neighborhood, he would leave small toys for her on the doorstep. The mother, who was barely making ends meet, approached Santa one day … he not in his red suit … and said how she was touched that someone was leaving things for her daughter which she was not in a position to get. Who’da thunk it, huh? … decidedly non-geek … and it is great fun! Thanks, Pete.